The Panasonic 440 Series has been discontinued. No direct replacement is available. Panasonic 440 Series offers a full color transmission/reception and real time video transmission/reception through multimode 4 channel FM video module and is compatible with NTSC, RS-170A & RS-343A and PAL. The 440 Series, designed for Panasonic Security System products can transmit four channels of high-quality video on one multimode optical fiber at 1300nm. The system requires no field adjustments at installation or additional maintenance and is completely transparent to all camera and monitor manufacturers. A quick visual indication of system status is also provided by diagnostic indicators. 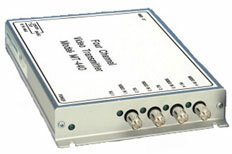 Additionally, two sub-carriers can also be added to each video channel using the 500 Series modulators and demodulators. Equipment may be ordered as stand alone modules or rack cards that are mounted in the Card Cage: SR20/2.